Cairns is a charming coastal town, but it’s not exactly a tourist hotspot on its own. The real draw for Cairns is that it is the gateway for the Great Barrier Reef. The world’s largest coral reef system, the Great Barrier Reef is actually a living organism. It can be seen from space. It’s both a UNESCO World Heritage Site and one of the Seven Natural Wonders of the World. All that said, the beauty of the reef up close and personal is still understated. Geared up and ready to head into the water! 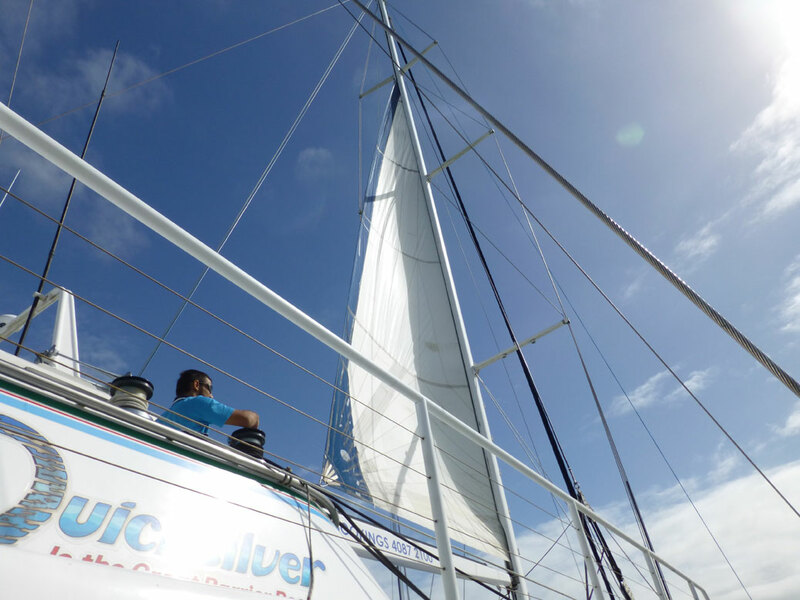 We scheduled two separate trips to the reef; one departing Cairns for the outer reef and another from Port Douglas (about 40 miles north of Cairns) bound for the Low Isles. The ride to the reef was a bumpy one. A good number of riders ended up seasick on the back deck. 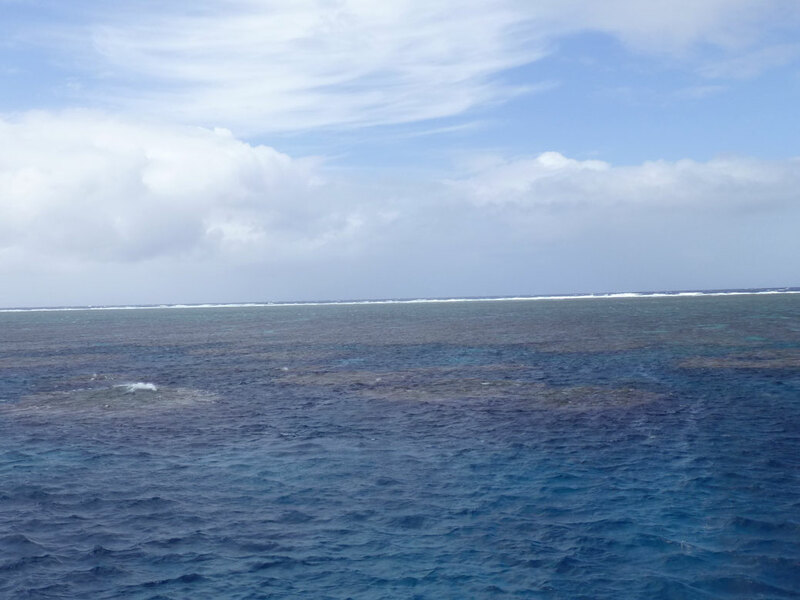 The first trip from Cairns went out about 27 nautical miles to the Flynn, Pellowe and Thetford reefs. 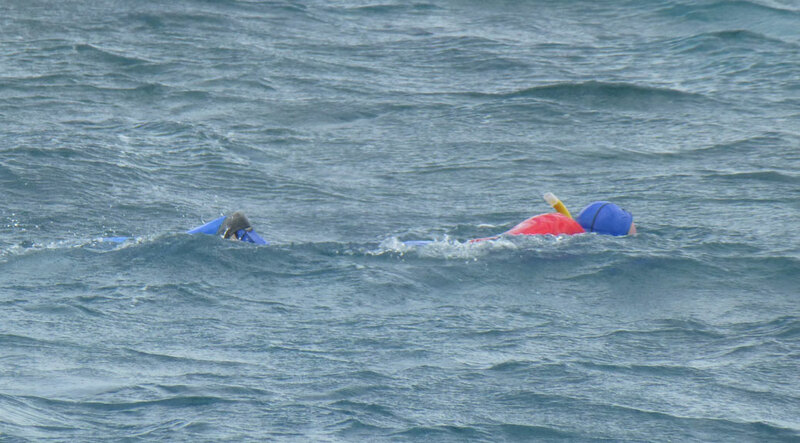 The weather was rainy and windy, resulting in some pretty choppy water. As we boarded the boat, we were encouraged to purchase seasickness medicine from the bar. Everyone chuckled with the certainty that WE would not be susceptible, but with the added information that all but six of the prior day’s 40 or so passengers got seasick, most popped the pills. 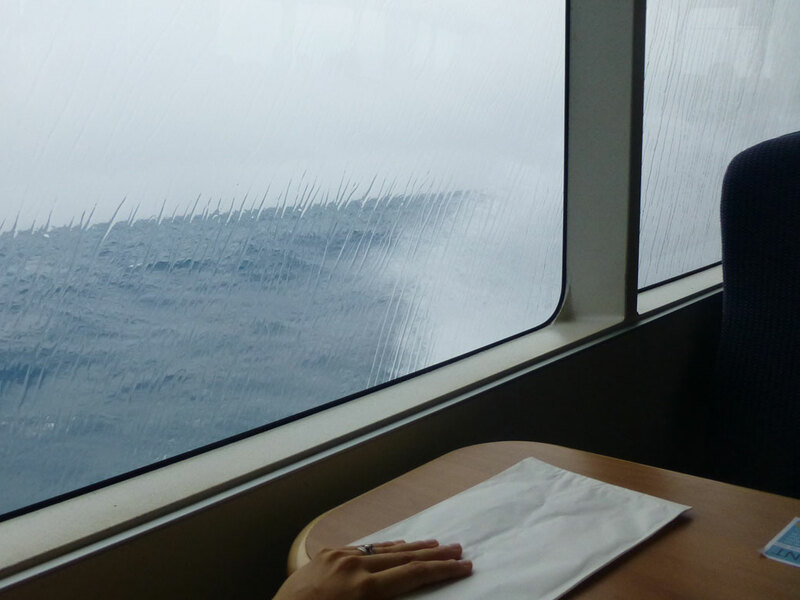 Regardless, about half the passengers spent a good portion of the trip on the back deck filling those little white paper bags. The water was crystal clear at the outer reef. We could see the fish swimming under the boat. All the misery of the ride would be forgotten as soon as we reached the outer reef. As the guides on board said, nothing cures seasickness like getting in the water. The beauty that lay just beneath the water’s surface would cure most ailments. 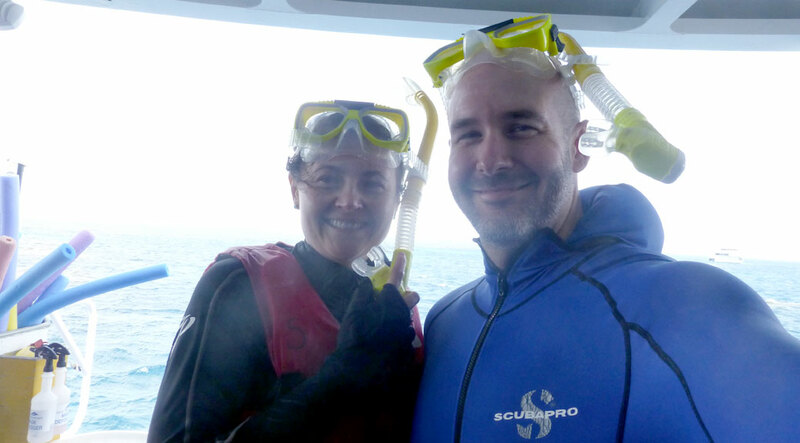 Floating on the surface of the Coral Sea, the underwater paradise opened up below us. It was like a real-life Finding Nemo with a world of fish in every shape, size and color. More than 600 species of coral provided an underwater maze to explore. The coral gets its rainbow of colors from the algae that makes a home within it. “Bleaching” or whitening of the coral occurs when the coral gets stressed and expels the algae. These are real, living organisms. 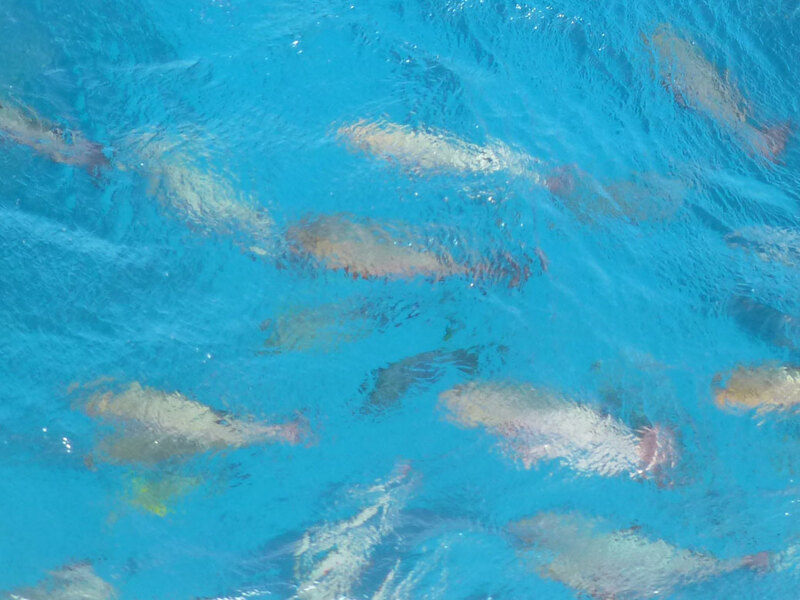 The Great Barrier Reef colored the surface of the water, offering a subtle glimpse of the magic below. We spent about 40 minutes at each of the three sites, guided along the way by the marine biologists who doubled as tour guides on board the boat. Along the way, we were followed by a humphead wrasse who befriended the boat seven years prior and follows it between the different reefs. In exchange for food, the fish poses for pictures with divers and snorkelers. A couple days later, we headed north to Port Douglas for a sailboat trip out to Low Island, one of the two islands that make up the Low Isles. It was a much slower, smoother trip just a few miles offshore. 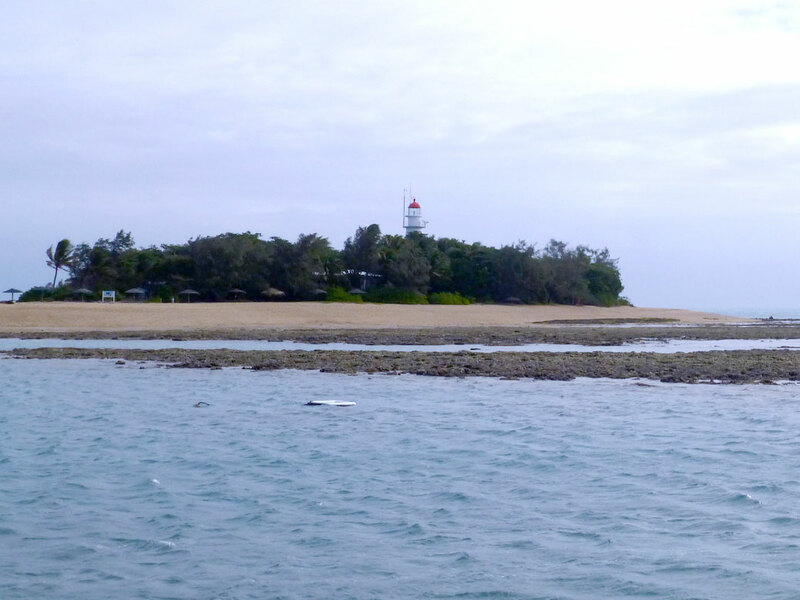 Low Island has an active lighthouse and the former keeper cottages are now used as research facilities by the University of Queensland. Snorkeling around Low Island offered a completely different experience. The marine biologists were amazed at how low the tide was, likely a result of the supermoon that occurred the same day. As a result, much of the coral was above water level. As we snorkeled around the edges of the island, we often found ourselves crawling along the sea floor more than floating above it. We were literally on top of the coral in some places and ended up with a front-row seat for one of nature’s most amazing creations. As we headed back to shore, we were visited by the island’s natives. 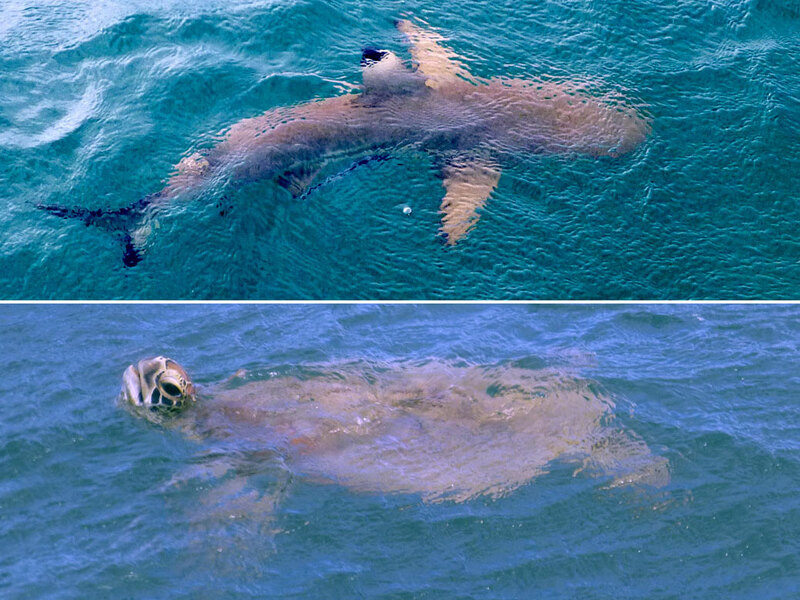 A black tip reef shark circled the boat several times and a green sea turtle floated lazily by before taking off on a fast swim toward the island. On the first trip, there was an underwater photographer who captured some of what we were seeing and while it would have been great to have an underwater camera, there’s something to be said for being able to focus on the beauty and not on capturing the perfect picture. The two trips were so unique that it’s hard to pick a favorite. If you ever have the opportunity to visit the reef, I’d highly recommend doing something similar or maybe even adding in an introductory scuba dive. The coral and marine life were so unique in each location, I can’t imagine it would ever get old. Excellent post Robert. I think YOU need to add a dive certification to your list! Snorkeling is like looking at a rain forest from an airplane. Diving is like walking through the forest. You see soooooo much more. I’m really happy to see you enjoying your time abroad. It appears you are taking full advantage of it! Thanks Brian! I think a dive is definitely in our future. We’ve been fortunate to be able to take advantage of our time over here to see a little bit more of the world. Did you see Nemo? 3 trips to the reef and I have yet to see one. But all 3 were great trips.